The firefighting pump articles provides guidance and review about different types, qualities, durabilities, and prices. This pump is used to supply the water at high pressure in the fire sprinkling system. They are powered by the electric power, diesel engine or steam power. Firefighting pump supplies the high-pressure water to the hose pipes and the risers in the water sprinkling system. This high-pressure water is then forced through the micro-nozzles. The water is sprayed like a water mist and helps in putting out the fire. The water mist gives us the maximum protection by cooling using heat absorption. It absorbs the heat by the evaporation of the water and extinguishes the fire. Water mist is also used to avoid the damage caused by the water flooding. Water mist eliminates the need to drain the water used for extinguishing the fire. Water used for firefighting is got from the underground water table or a storage source. Usually, these pumps transfer water to extinguish the fire and is called as firewater pump. These pumps are checked and certified by National Fire Protection Association (NFPA). They must strictly adhere to the rules and regulations as per the association guidelines. This pump system needs to maintain high-pressure level artificially. Therefore when a single fire sprinkling system is operated, pressure drops across the firefighting system. This pressure drop is sensed by the firefighting automatic controller which in turn operates the firefighting pump. The entire firefighting system is then activated. The artificial high-pressure developed in the firefighting system is maintained by a small pump called as the jockey pump. The jockey pump ensures the effective operation of the firefighting system by generating a pressure drop in the sprinkler system. It is also one of the essential parts in the firefighting system. A jockey pump is a small flow rate pump and provides a maximum flow of about 3% of the main flow in the firefighting system. They can provide 10 psi more pressure than the pressure in the main pump in the system. 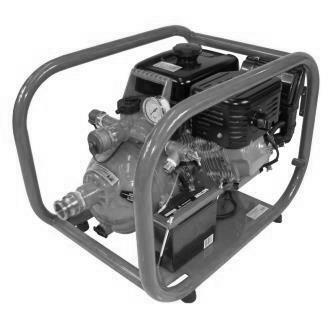 A Jockey pump is a small multi-stage centrifugal pump. Let us now look at the advantages of using a firefighting pump in the fire extinguishing process. Minimize the damage caused due to the water. A firefighting system must be selected based the various operational and physical factors. Let us go through the various important factors considered while selecting a firefighting pump as follows. Head – the distance up to which the water can be pumped from their source. The water flowing through the pump at the maximum head is zero. We have to select the pump with head suitable according to the height to which the water is to be lifted. It is measured in terms of distance as meter or feet. Flow rate – the amount of water to be pumped in required time. It is expressed in terms of the volume per unit time. For the domestic purposes, the flow rate must be around 200 – 1000 liters per hour. Pressure – the amount of pressure maintained in the pump causes the mist formation. And pressure is linked to the head of the pump. The pump must be able to provide the effective pressure for the efficient functioning of the firefighting system. Self-priming – A firefighting pump must always be a self-priming type pump. They must be able to overcome the resistance caused by air blockage along the pipelines. They must be ready to operate at any time without any delay. Accessories – We must consider the other factors such as the nozzle size, its ability to form water mist, hose pipe length, and ability to access all the sides. The effective isolation of power cables must be provided to avoid short circuiting. This pump has become one of the basic needs in our modern world. They find themselves in almost every place such as the commercial complexes, factories, industries, thermal power plants, airports, ports, residential buildings, warehouses, etc. Some of the manufacturers of firefighting pumps are Danfoss International, Kirloskar Pumps, Grunfos Inc., Fire fly pumps and Feld fire pumps. Their price varies depending on their specifications and operating conditions from 500$ to 4000$. Danfoss International is one of the leading pump companies. They provide firefighting pumps for large industries and thermal power plants etc., where the high capacity pumps are required. Kirloskar Pumps and Grunfos Inc. are also leading pump manufacturers and they concentrate on providing pumps to industries, commercial complexes, big residential buildings, etc. Firefly pumps are mainly into the manufacture of portable fire pumps where you can move the pumps to the required place for operation. The pump can be either be skid mounted or trailer mounted.